Deceased donors can give multiple organs that will improve or save the lives of several people. In 2004, there were more than 20,000 transplant operations utilizing organs from more than 7,000 deceased donors, an increase of close to 11 percent over the 2003 total. That increase was the largest in the last 10 years and the second highest annual increase since national records began to be collected in 1987. Organ transplants from deceased donors rose by 1,368 (18,650 to 20,018) from 2003 to 2004, a 7.3 percent increase. In addition, transplant operations using an organ donated by a living person also hit a new high -- 6,966 -- in 2004. That number grew by 154 (6,812 to 6,966) from 2003 to 2004, a 2.3 percent increase. Organ donations from living persons are limited to a single organ, usually the kidney, or piece of a single organ. Human beings have two kidneys but can lead healthy lives with only one. Citing the growing need for organ donation to save and improve lives, Tommy G. Thompson, within his first 100 days as HHS Secretary, announced his commitment to develop a new national effort to encourage organ donation. That commitment, also known as the Gift of Life Donation Initiative, led to 2004's record transplant totals through which the number of transplant candidates who died waiting for an organ fell below 6,000 for the first time in six years. In 2003, HHS' Health Resources and Services Administration (HRSA) launched the "Organ Donation Breakthrough Collaborative," to bring together donation professionals and hospital leaders to identify and share best practices to maximize donation rates from potential organ donors who die in their facilities. While donation from deceased donors rose both in hospitals participating in the collaborative and in those not taking part, the increase was higher for those in the collaborative (16 percent compared to 2003) than for non-participating hospitals (9.4 percent). According to preliminary data from the Organ Procurement and Transplantation Network (OPTN), the two most common transplant procedures in 2004 increased substantially over 2003 totals: kidney transplants rose more than 5 percent and liver transplants increased nearly 9 percent. The number of heart transplants decreased slightly in 2004; demand for heart transplants has slowed due to advances in other medical and surgical procedures to treat heart disease. OPTN maintains data on donors, transplants and the national patient waiting list under contract from HRSA. Earlier this morning (March 31, 2005), Terri died. The 11th United States Circuit Court of Appeals rejected the petition filed by Terri's parents by a vote of 9-2. Terri's parents appealed to the United States Supreme Court. The United States Supreme Court rejected Terri's petition for an emergency appeal. Although Justice Kennedy could have ruled on the appeal on his own, he referred the petition to the entire Court. Late yesterday (March 29, 2005), a federal court granted Terri's parents permission to file a petition in their attempt to have Terri's feeding tube reinserted. However, the court has not yet granted a hearing on the petition. During The Tonight Show last night (March 29, 2005), Jay Leno entered the realm of estate planning with one of his monologue comments regarding Burger King's new Enormous Omelet Sandwich. Background: The Social Science Research Network (SSRN) is an electronic archive of abstracts to, and full text reproductions of, scholarly papers in the social sciences, including the study of law. Legal scholarship fits within the Legal Scholarship Network (LSN), a subdivision of the SSRN. The SSRN’s archived materials are available for public downloading from the SSRN web page at www.ssrn.com. The web interface also allows for searches of the database, which provides a simple but powerful means for assaying cutting-edge research on any topic within the SSRN inventory. The LSN has become a central clearinghouse for legal scholarship. In addition to providing a web-based archive of papers and abstracts, SSRN provides a distribution function. Listings of newly posted materials are emailed regularly to subscribers. These emails, called journals, are organized by subject. Thus there are contract law, constitutional law, corporation law, tort law, and numerous other subject matter journals within the LSN. The Problem: Notably absent from the current inventory of journals is one for papers or abstracts concerning wills, trusts, and estates. Accordingly, those of us who write in the field must announce our papers in other, less suitable journals-or not at all. Not only does this stymie the circulation of interesting ideas in trusts and estates, but it also lowers the profile of trusts and estates in the legal academy. The Solution: Thanks to a grant from the American College of Trust and Estate Counsel Foundation, SSRN has created a new LSN abstracting journal, Wills, Trusts, and Estates Law Abstracts, which will be edited by Robert H. Sitkoff of Northwestern University School of Law. How to subscribe: Subscriptions to this journal are free. You can subscribe to the journal at http://hq.ssrn.com/jourInvite.cfm?link=wills-trusts-estates You will need to enable session cookies on your browser to use this link or to access our user headquarters at: If you have any questions please call 877-SSRNHelp (877.777.6435).http://www.ssrn.com/, and click on the link for submissions. Special thanks to Prof. Robert H. Sitkoff, Associate Professor of Law, Northwestern University School of Law for supplying the text of the blog entry. 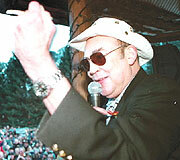 Hunter S. Thompson, the King of Gonzo journalism (defined as, "journalism [which can be] more truthful without strict observance of traditional rules of factual reportage" according to Wikipedia) died of an apparent suicide on February 20, 2005. Three days later, his will date June 27, 2003 was offered for probate. The will leaves his property to "The Gonzo Trust" and provides for his estate to pass through this trust managed by Hal Haddon of Denver (the attorney who represented Kobe Bryant ), George Tobia of Boston (attorney), and Douglas Brinkley of New Orleans (historian). Special thanks to Raymond Sheffield who suggested this topic. The Winter 2005 issue of the Real Property, Probate and Trust Journal contains two extremely interesting articles addressing issues impacting trusts. Jonathan Scott Goldman, Just What the Doctor Ordered? The Doctrine of Deviation, the Case of Doctor Barnes's Trust and the Future Location of the Barnes Foundation, 39 Real. Prop., Prob. & Tr. J. 711 (2005). Robert Whitman, Resolution Procedures to Resolve Trust Beneficiary Complaints, 39 Real. Prop., Prob. & Tr. J. 829 (2005). Terri's parents continue to plead with Florida and United States lawmakers to save their daughter. As part of a extensive bill tweaking various aspects of Texas Trust law, the Texas legislature is considering a provision authorizing pet trusts which is based on Uniform Trust Code § 408. Follow this link for a comprehensive list of states with legislation authorizing pet trusts.